EghtesadOnline: The world’s two most powerful central bankers on Friday delivered back-to-back warnings against dismantling tough post-crisis financial rules that the Trump administration blames for stifling U.S. growth. 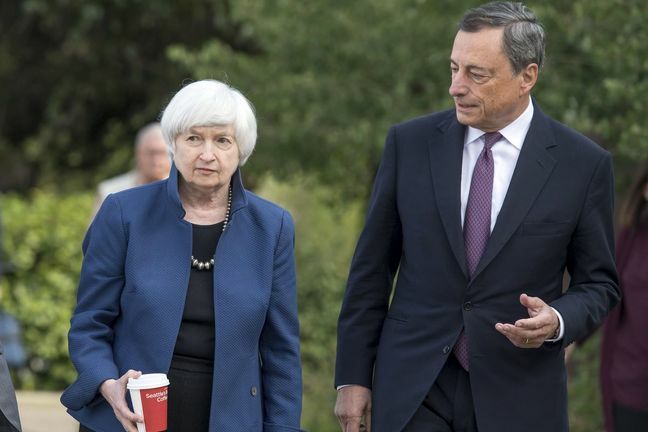 European Central Bank President Mario Draghi, speaking at the Federal Reserve’s annual retreat in Jackson Hole, Wyoming, said it was a particularly dangerous time to loosen regulation given that central banks are still supporting their economies with accommodative monetary policies, according to Bloomberg. The combined effect was “a subtle shot across the bow of those who seek deregulation,” said Michael Gapen, chief U.S. economist at Barclays Capital Inc. in New York. The complementary speeches come at what may be the tail end of Yellen’s tenure at the Fed’s helm. President Donald Trump is not expected to reappoint her when her leadership term expires in February, according to economists surveyed by Bloomberg. In a talk aimed broadly at defending the merits of globalization, Draghi said it’s crucial to make sure open policies on trade and global finance should be safeguarded with regulations designed to make globalization fair, safe and equitable. “We have only recently witnessed the dangers of financial openness combined with insufficient regulation,” Draghi said, referring to the global financial crisis of 2008-09. That point was all the more important given that central banks are continuing to provide stimulus to their economies. “With monetary policy globally very expansionary, regulators should be wary of rekindling the incentives that led to the crisis,” Draghi said.